In addition to requesting an initial tax levy in support of the library, the Board also asked the City to grant the use of the upstairs auditorium in the City Hall to house the library. In November of 1925, the Board agreed that a contract should be given to Mrs. Daisy L. Pressey, who accepted and became the first Librarian. On January 12, 1926, the City Commission approved the use of the upstairs auditorium at City Hall for the exclusive use of the Library until such time as other quarters could be found. The Library opened with approximately 1,200 books on the shelves. By 1927 the books totaled near 3,000. Initially, the use of the Library was for adults only. As the collection grew and donations became more prevalent, the Board voted to allow all children attending school in Horton free use of the Library. November, 1929 was the first time National Children’s Week was observed and it was a huge success. Following the “Crash” of the late 1920’s, money was scarce and it was a dire time for the library. It looked as if it would have to close in November of 1932; however, Mrs. Pressey insisted that the Library be kept open at whatever amount they could pay her and whenever they could pay her, as she felt the people of the town needed the Library so badly. The library survived and by 1935 was able to hire an assistant librarian, Mrs. Anna Bernet. In 1937, Mr. & Mrs. Martin Hardin and Mr. & Mrs. F. M. Wilson requested that the Library Board accept the grant of deeds to their properties located at the intersection of 8th Street and what is now 1st Ave. West to be used for the erection of a library building. The deeds were recorded on January 27, 1937. A large, red brick two-story bank building, which faced 8th Street, occupied the south end of these lots. It was determined that the building would need to be dismantled and a new one erected. On March 8, 1937 the Library Board approved the filing of an application with the Public Works Administation for aid in erecting a Library building. At the same meeting, the Board also requested that the City Commissioners submit to the electors of the City, the question of issuance of bonds in the amount of $25,000 for erection of a public library – it was expected that the PWA would contribute 45% of the total cost. Charles W. Shaver, an architect from Salina (also assisted in the erection of the Sabetha Library) was hired to draw up plans for the new library. A public meeting was held April 2, 1937 at the High School auditorium to show the public the plans and answer any questions about its construction. In dealing with the government and in the building plans and contracts, it became evident that the City should have the deeds to these lots in their name and were asked to obtain possession of them for the Board, which they did. In January, 1938, Mrs. Anna Bernet was hired as the librarian following the resignation of Mrs. Daisy L. Pressey. Mrs. George W. Wilson was hired as the assistant librarian at the same time. The bond issue was approved for the $25,000 building in April 1938, with the City’s share to be $13,750. The Board anxiously awaited the notification from the US government that their request for P.W.A. assistance had been granted. It came in July, 1938. Construction was to start immediately and completion of the building was to occur within 4 months of commencement. The Library building was completed December 30, 1938. An open house was held January 11, 1939 in the new building, which is the same building used today. The Library adopted the slogan “Your library is a bank of knowledge; your account there is unlimited” which was submitted by Gerald Braley in a slogan contest held for the new library. By 1943, the Library’s collection had risen to 7,000. By 1949, the magazine collection had become so large that a room was designated as the magazine room with shelving built floor to ceiling around the walls of the room. As many know, the summer months in Kansas can be very warm. The library building did not have air conditioning until 1956 when 2 window units were installed. The basement suffered the fate of many basements here with water seeping in and the floors cracking. In the early 1950’s the City dug down to the bottom of the building’s foundation, sealed the outside walls and put tile around the foundation to carry water away from the structure. The basement floors and walls were painted – the first time since the building was erected. For a number of years, the hours of the library had been from 3:00 – 5:00 in the afternoons and from 7:00 – 9:00 in the evenings – 20 hours per week. During the early 1960’s the hours were extended to an extra hour to open at 2:00 in the afternoon. Today the Library is open 28 hours during the week and 4 hours on Saturday. In the spring of 1964, a book drop was placed outside the building to allow patrons to return books at any time of the day or night when the library was closed. The Federal Government began allotting monies to the States for the use of libraries during the 1960’s – provided the State could match the funds. Initially Kansas was unable to match the first grant amount and all of the monies could not be used. The library did receive a Webster Dictionary and a few other books from the granted money. By 1965 the Kansas Library Association and the State Library had begun to organize an Assembly of Libraries as a direct result of the grant funds. The Northeast Kansas Planning Grant Area was the Assembly that we chose to join and by 1968 the Assembly was almost completed as a working organization. 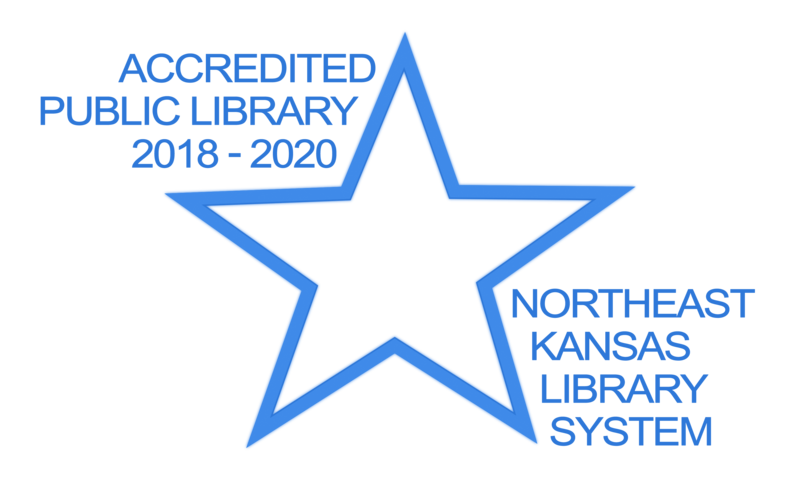 We are still a member of this group which is today called the Northeast Kansas Library System (NEKLS). They are the largest supplier of funding outside of our local tax revenue. Additionally they provide training, computer tech support, program ideas and assistance in all areas of library service. Also during the late 1960’s the Library began participating in the KIC (Kansas Information Circuit), a wonderful service which allowed our Library to “borrow” a book from another library if it was not on our shelf. Today this is the ILL service (Interlibrary Loan) and books are available from nearly all libraries in Kansas and in some cases from other states. By 1968 the library owned 13,903 volumes. In January 1989, the Horton Public Library celebrated its 50 year anniversary at its present site. Carleen Howieson was hired as the Librarian in 1972 following the retirement of Mrs. Elizabeth Wilson on March 31. Jeanne Scholz, hired in August 1969, was the assistant Librarian at this time. In August 1979, Mrs. Sharon L. Lowe became the assistant Librarian. On the southeast corner of the Library’s lot, rests a limestone boulder from the railroad viaduct at the south edge of Horton, salvaged by Jimmy Dan Allen. Inside the Library one can find a collection of 24 WPA dolls.